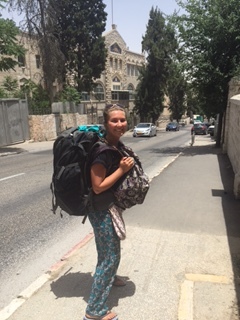 Belfast to Bethlehem – The journey – The Eternal Gap Year! I have openly called myself a Pro Palestine supporter since I began to learn about the daily atrocities and continuous violation of human rights & International humanitarian law happening in this part of the world. However I openly admit I am in no way an expert on this very complex situation so have come with an open mind and a thirst to learn more. The blogs I write are simply an honest expression of my own experience living and working in the West Bank, Palestine. It has only been here a few days but it feels like I have been here months. Already I have learnt, experienced, tasted and felt so many new things I feel like I could write a book and my head is actually spinning with ideas and information! I thought I better start writing this stuff down and communicating my experience so far! Stepping off the bus in Bethlehem and hearing the first ‘Welcome to Palestine’ was such a relief, I almost cried. As we were flying into Tel Aviv, Israel I was advised by various people not to mention the fact that we are travelling to the West Bank to work as we will not be granted access. Therefore Me and Annagh spent our time in Istanbul airport, while waiting for our connecting flight deleting all email contact we had with Palestine, learning some top tourist destinations in Israel and planning our made up itinerary for 6 weeks. Should we be asked at passport control what we are doing here we planned to play the sisters backpacking card “What a fun country to travel around!” This encounter was surprisingly easy, we played the role well (A in GCSE Drama thank you very much!) and were handed visas and told to enjoy! We almost didn’t believe that was us in, while walking out of Tel Aviv airport onto the bus to Jerusalem and throughout the 1 hour journey to the hotel we were sure there was going to be more checkpoints and kept up these roles just in case it was too good to be true; but thankfully, is wasn’t. We arrived into Jerusalem late at night, got some much needed sleep and got ourselves ready for our onward journey to Bethlehem. Throughout the short time we spent in Israel I was taken aback by the atmosphere of the place. It almost felt like a futuristic, parallel universe! The roads, streets, buildings all had a ‘new’ modern feel about them, mixed with the old town of Jerusalem and the western behaviours of the people it was place I could not figure out! Israeli flags lined the massive highway roads and nearly every building. I am not a fan of flags of any kind but I find it fascinating the feeling it provokes in me depending on which flag I see. I wonder is it a product of growing up in a divided society where flags are often used as an indicator of what community you are in and traditionally how safe you are/feel while there. At home the Israeli flag is used in some Loyalist areas, which could be why, without even realising it I feel an automatic feeling of fear when I see it. With this feeling and knowing we would get deported if anyone found out why we were there made me keen to get into Palestine as quick as possible! Leaving Jerusalem headed for Bethlehem! On the bus leaving Jerusalem many thoughts were going through my head. I seen clips of checkpoints on the boarder of Israel and Palestine and they did not look pleasant! My thoughts were manic ‘How would I react to their questions?’ ‘What if they don’t let one of us in?’ ‘What if Annagh starts being cheeky to them and they take her away! ?’ ‘How am I going to protect her?’ I tried to channel these thoughts and replace them with positive ones; like ‘Don’t worry Mickybo, it’ll be grand’ and it was! Bethlehem is very popular for tourists, however people normally take a guided day tour in and out in half a day; which is what the receptionist at our accommodation in Jerusalem advised us to do when we told him we were going to Bethlehem, and said he didn’t know of anyone ever doing it independently; this I find hard to believe considering there’s a public bus goes every 20mins! We sourced the public bus and carried our bags the half hour walk in 35degree heat, instead of slashing out on a taxi to the bus stop (this would have cost about a fiver tops)! We got on the bus and set off out of Jerusalem. Many local Palestinians boarded the bus. 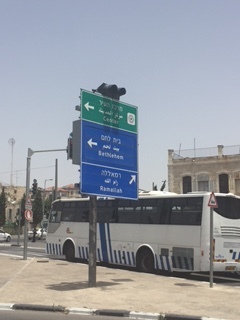 At the time I thought Palestinians were not allowed in Jerusalem so I was confused when they got on but I have since learnt that some Palestinians live in West Jerusalem and access is granted for some West Bank citizens with a special permit. It is very rare for a Palestine to get a permit, they must go through a rigorous application process and only few are granted. Israel can revoke or suspend their permits at any time, such as after the recent shooting in Tel Aviv which resulted in Israel suspending 83,000 Palestinians’ permits during the month of Ramadan and upping the Israeli military presence in the West Bank. (A story for another blog!) 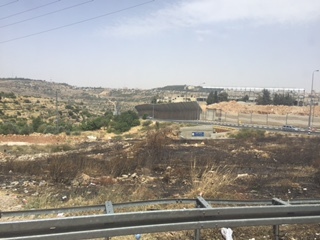 As we left Jerusalem we entered into what looked like no-mans land. Purpose built massive tall walls, curving at the top, making climbing them impossible lined the road, we went through tunnels and huge road checkpoints on the main road that looked like a toll booths. Barbed wire covered lookout towers and what looked like military huts. Eventually the bus stopped and the driver told us to get off! This is when we heard our first ‘Welcome to Palestine’ – what a relief. I still am unsure why this was so straightforward, maybe trying to get back into Israel to come home will not be so simple! Leaving my sister in the taxi as I got out at my organisation was difficult. I warned the taxi driver to look after my little sister he said “Don’t worry she is a sister to me also!” Me and Annagh were trying to work out on the map how far away from each other we would be, one map said 6 hour walk! Turns out she’s 20mins down the road, no drama! The director of my organisation was at a meeting in another town so a very kind colleague was waiting on me in the youth organisation I will be working in. He had sent everyone else home as it was a very hot day and being on Ramadan, (not eating or drinking anything between sunrise and sunset), they were busted! He gave me a quick tour of Bethlehem in the car then brought me to my accommodation which the director had arranged. We pulled up outside a nunnery (! ), a frail looking nun opened the door, she could not speak English or Arabic and told us to return in 2-3 hours. I think my poor colleague just wanted to go home to sleep! But instead he took me for lunch; knowing he was fasting I really tried to stop him bringing me for food but he insisted. So while he sat starving, thirsty and dying for a smoke I ate delicious falafel and got a brief rundown of Palestine, the Israelis occupation, the resistance movement; you know general lunchtime chit chat! We returned to the nunnery and a few other nuns appeared they welcomed me in and my colleague took off. None of these nuns could speak English but they politely sat me down, we smiled at each other and communicated our names, they brought me juice, sweets, chocolates but after an awkward 10mins it was clear no one knew what was going on! I attempted to communicate that I was due to stay there, they did not understand but continued to smile and nod. It was like a scene from Father Ted! Thankfully after a further 10mins (but what felt like a week) my colleague came running back saying “I got the wrong nunnery you aren’t staying here come on”, I politely got up and we left! God love those nuns like being so lovely to me and not having a clue what me and all my luggage were doing there! After getting a warm welcome into the nunnery that was expecting me I went out to explore Bethlehem…. What an eventful start. Cant wait to see the next blog I was unaware of many of the situations you were faced with. Your very brave. Wow… so brave of the two of you to go. I hope you’re abe to take a few photos of what we don’t normally see while you’re there. Thanks very much Christy it sure is an adventure! Awesome blog Michaela! What an insight into live in Israel. Looking forward to reading the next one :)! Thanks Tom coming up soon…. You’re very brave girls, it sounds like a bit of a scary start but hopefully things will run smoothly from now on. I can understand having your sister with you is a comfort and a worry…you couldn’t help but feel responsible….but what an life changing experience for you both. Thanks G yes it sure is life changing already! 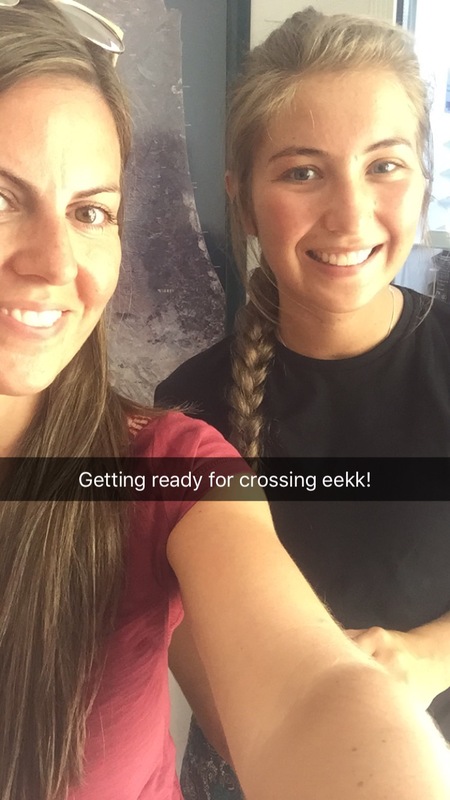 May the 2 of you stay safe…..
Great opening blog on the start of your adventure! I’m just really looking forward to reading, learning and hopefully communicating with some people there to help me understand more! very insightful beezer and was hooked on every word. Looking forward to your next blog. Cheers Jos another one coming up soon…. Facinating Michaela, I hung on every word. Keep it coming if you can. Can’t wait for the next instalment. Stay safe. Thanks Ash yea I got the 21 Arab bus no army came on, people have said it was getting better but it has been stepped up again now after the shootings in Tel Aviv. I’ll be going back and forth so will keep you posted!